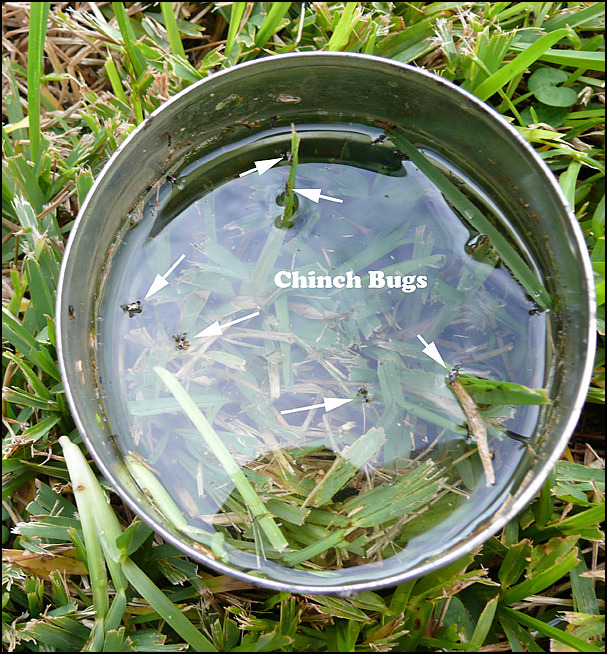 Chinch bugs are one of two or three woes associated with St. Augustine lawns. They tend to invade when the ground is dry and eat the roots of the grass. 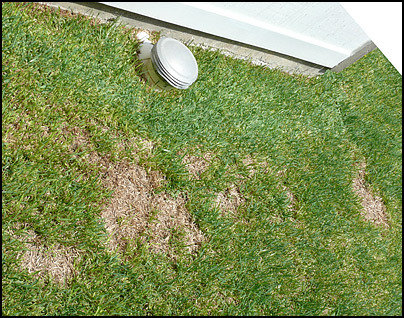 When you see dead patches in your St. Augustine lawn like in the picture at the right, there's a good chance your lawn has become infested with them. 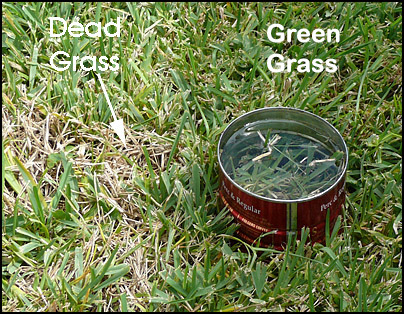 If you don't keep a watch out for these areas they can spread and kill your entire lawn. One problem in noticing them early is the grass they have killed doesn't turn brown immediately. So, they have progressed further than the the spots you see. 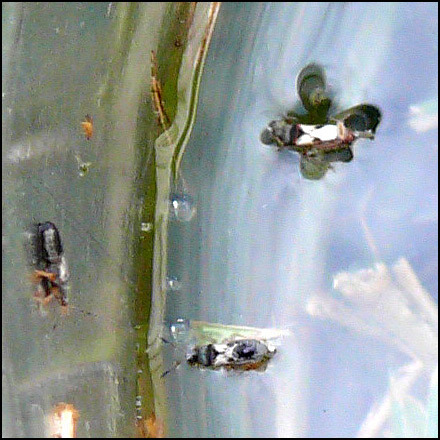 If you begin to see the dead patches, immediately check for the bugs. 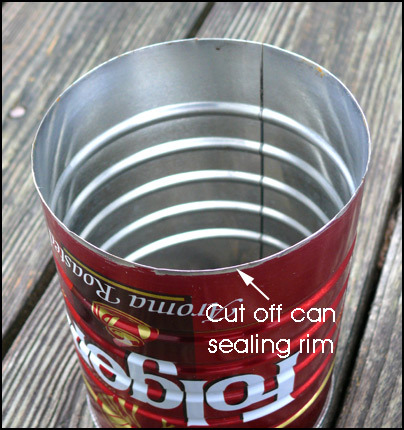 Cut the sealing rim from a coffee or similar size can. There's probably other ways, but I cut it off with tin snips. By cutting off the rim you make the can sharp so it is easer to proceed with the next step. Work the can into the grass just outside of the dead area, where the grass is still green. This is where the bugs are probably eating now. I rotate the can back and forth so it cuts it's way through the thatch drilling down into the soil. It must go deep enough into the soil to hold water. If you go only part way into the grass water will not stand in the can. Depending on how much thatch you have it can be a little difficult to cut through it. Then use a garden hose to fill the can with water. It may keep soaking in for a while so keep the hose handy. Leave about a half inch or so between the top of the can and the water. Now watch for bugs to come to the top. They have to come up for air. Don't be surprised if you get a spider or centipede or other critter. They don't come up instantly. Watch the water for a minute or two. 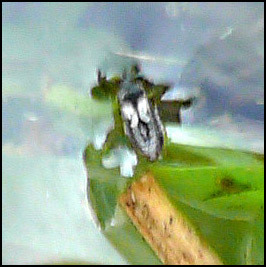 Chinch bugs are about 1/8 inch long and look like this giant picture. They're harmless to humans. If you have them they will begin coming to top of the water like in the pictures below. They swim around like crazy and crawl up on things to get out of the water. 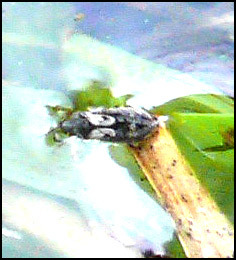 spot them immediately by their size and the white markings (wings) on their back. I really don't have much advice here. I used to use a poison that worked perfectly, but is has since been banned. 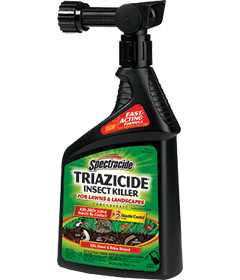 Recently I've been using Spectracide® Triazicide® Insect Killer which seems to work. You can get it at Lowe's or Home Depot.